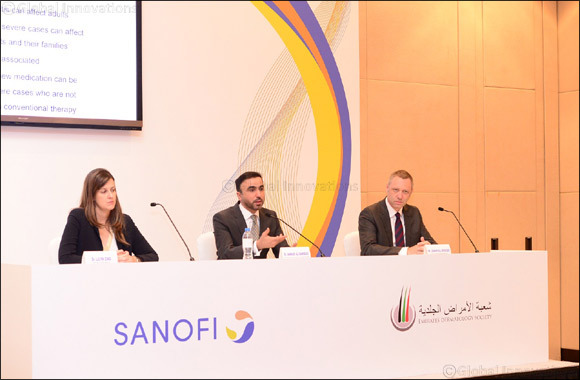 Dubai, UAE, 11 March 2018 – Under the patronage of the Emirates Dermatology Society, Sanofi today announced the launch of an innovative therapy, that is seen to significantly help adults with moderate-to-severe atopic dermatitis (AD). After receiving a fast-track approval by the Ministry of Health & Prevention, UAE is one of the first few countries in the world to make the therapy available to patients. “Launching healthcare innovations in the UAE is high on the agenda of the Ministry of Health & Prevention, and we have taken significant steps in the past years to accelerate availability of innovations and breakthrough that improve people's life and enhance their happiness. We are indeed driven by the vision of our beloved country leaders who want people living in our beautiful country to enjoy highest standards of life,” said His Excellency Dr. Amin Al Amiri, Asst. Undersecretary for Public Health Policy and License Sector in UAE Ministry of Health & Prevention. Atopic dermatitis, a form of eczema, is a chronic inflammatory disease with symptoms often appearing as a rash on the skin. , , , It is caused, in part, by an underlying inflammation in the body that is believed to be driven by an overactive immune system. Moderate-to-severe atopic dermatitis is characterized by rashes often covering much of the body, and can include intense, persistent itching and skin dryness, cracking, redness, crusting, and oozing. , Itch is one of the most difficult symptoms for patients and can be severely debilitating.7 In addition, they experience impaired quality of life, including disrupted sleep, and increased anxiety and depression symptoms along with their disease. The new therapy introduced is jointly developed by Sanofi and Regeneron under a global collaboration agreement. It is a ﬁrst-in-class biologic medicine approved by the European Commission (EC) to treat adults with moderate-to-severe atopic dermatitis (AD) who are candidates for systemic therapy. The EC approval of the medicine was based on data from the global LIBERTY AD clinical trial program that included approximately 2,800 adults living with this serious disease. It has demonstrated a significant reduction in the signs and symptoms of the disease and improvement in quality of life. “As physicians, we welcome the timely access to this important new medication to help provide patients relief from this severely debilitating condition. As members of the UAE society, we all have a vital role to play towards raising more awareness; and hence, creating better understanding of what people with the condition go through,” added Dr. Al Hammadi. Attendees at the press conference launch had the unique opportunity to experience the impact of atopic dermatitis through an art installation that captured an emotional journey through testimonials, real feelings and stories of people living with the condition. The announcement comes ahead of the medical launch of the innovative therapy for healthcare professionals on 9 March. It is expected to be attended by leading dermatologists in the country, along with global and regional experts. “At Sanofi, it remains a key priority for us to bring first to the country innovative treatments, and to make sure that the most number of people to have access to them. The efforts of the UAE Ministry of Health to accelerate availability of new innovative treatments for the patients in the UAE is, indeed, remarkable,” said Jean Paul Scheuer, Country Chair and General Manager for Sanofi Gulf. The introduction of this therapy is an important milestone for people living with moderate-to-severe atopic dermatitis in UAE.